Boards and executives are becoming increasingly involved in cybersecurity planning and strategy discussions. This is a marked improvement over the last decade, much of which is due to media-catching headlines and public incidents. But those headlines are a double-edged sword. Now executives not only want to know how their organization is doing with regards to cybersecurity, but also how they compare to their peers. There’s no mystery as to why this question comes up—cybersecurity is full of acronyms, terms of art, and is deeply technical. It may not always be obvious what steps to take next. And while maturity models inherently describe how to “crawl, walk, and run,” some organizations may rightfully ask, “do we really need to run right now, or is walking fine for our cybersecurity program?” Well, as the old adage goes, when fleeing from a bear at a picnic, you do not need to be faster than the bear—just the person next to you. Some executives, whether right or wrong, may just want to know if the person next to them is running faster. 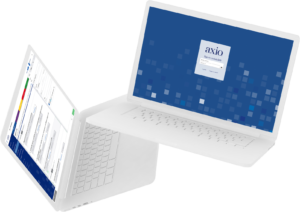 At Axio, we believe maturity models have a vital place in program management. But we also understand the power of benchmarking and data analytics. That’s why our Axio360 platform leverages both. Not only can you evaluate your program using either the C2M2 or CSF, but you can also provide valuable benchmarking analytics to board and executives. Combined with the other elements of 360, including cyber risk quantification and insurance analysis, your security program will be equipped with meaningful metrics. We’ve seen clients use our platform to promote budget justifications, hiring additional resources, and getting further executive buy-in on important security and financial controls. At the end of the day, executives want to know the right thing is being done. Maturity models, and data analytics, can provide that peace of mind. Read more about the C2M2 and CSF and see how these self-assessments can help your program. Jason D. Christopher is CTO at Axio Global, Inc. where he merges risk management services with enabling technology. Copyright 2018 Axio Global, Inc. The time has come for you to take control of your cyber risk.